Sarcastic Fringeheads are the largest members of Chaenopsidae family. They can reach up to 30.5 cm (12 in) long. Their heads are very large, with bluntly rounded snouts and prominent lips. The huge jaw extends back well past the eye and is larger in males than females. They have wavy, fringe-like appendages called cirri over their eyes. They are omnivores and they are believed to live about 6 years. They are found in the Pacific, off the coast of North America, from San Francisco, California, to Central Baja California, Mexico. Their depth range is from 3 to 73 meters (10 to 240 ft). Typically, they occupy empty shells, abandoned holes and crevices. In some areas they even take up residence in old cans and bottles. 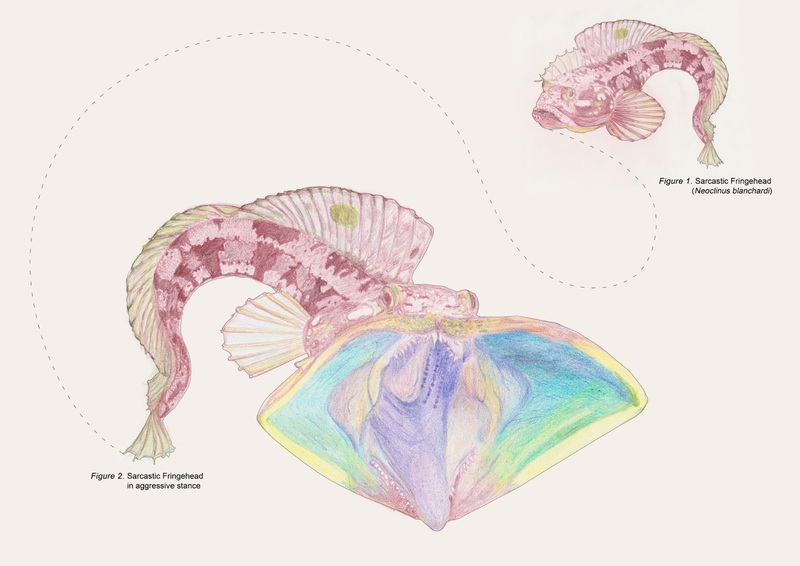 Sarcastic Fringeheads are extremely temperamental. They are fiercely territorial creatures that aggressively protect their homes from all intruders, regardless of size. Upon the first sign of danger, they will employ their enormous mouths and needle-like teeth for defense as shown in the illustration. Initially, they emit only a warning accomplished by the flexing and snapping of their jaws. If the intruder ignores the warning, they will use their ferocious teeth to attack.